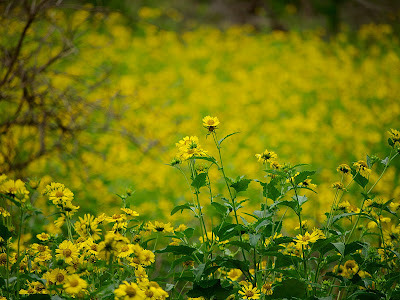 With all the recent rain the wildflowers are going off. Everything that was brown and dead in the prolonged drought last year is now verdantly lush. More big sets rolled in on west facing shores this morning, making getting in and out a challenge. My heart was racing yesterday morning at the end of our swim when I timed my exit from the ocean for between sets. I almost waited one too many, but got out unmangled. It should be interesting dragging my kayak out tomorrow morning. Stay tuned. You know, it's always those one footers that roll me.